Czech Republic announces honorary consulate will reopen in May. The Czech Republic announced on Wednesday the reopening of its honorary consulate in Jerusalem as President Milos Zeman reiterated his wish to move the Czech embassy to the city from Tel Aviv. "The Czech Republic has decided to open in May an honorary consulate in West Jerusalem, and before the end of the year a Czech center, also in West Jerusalem," the ministry said in a statement. 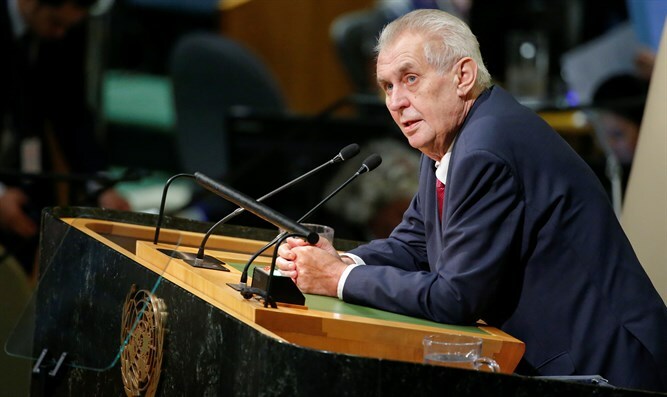 President Zeman, known for his pro-Israel stance, repeated Wednesday evening his desire to see his country's embassy transferred to Jerusalem. Speaking at Prague Castle, he said he remembered discussing it with Benjamin Netanyahu, quoting the Israeli Prime Minister as saying: "If you do, I will give you my own house." Zeman added: "By the way, I strongly refuse the accusation that we copy the United States of America. Contrary to that, the United States of America copied my proposal." He also criticized objections to the idea from European nations, calling them "cowards". Netanyahu responded in a letter, in which he said: "I am delighted that I will be able to welcome you towards the end of this year to Israel, where, as I hope, we can open the Czech Embassy in Jerusalem, the eternal capital of the Jewish state."